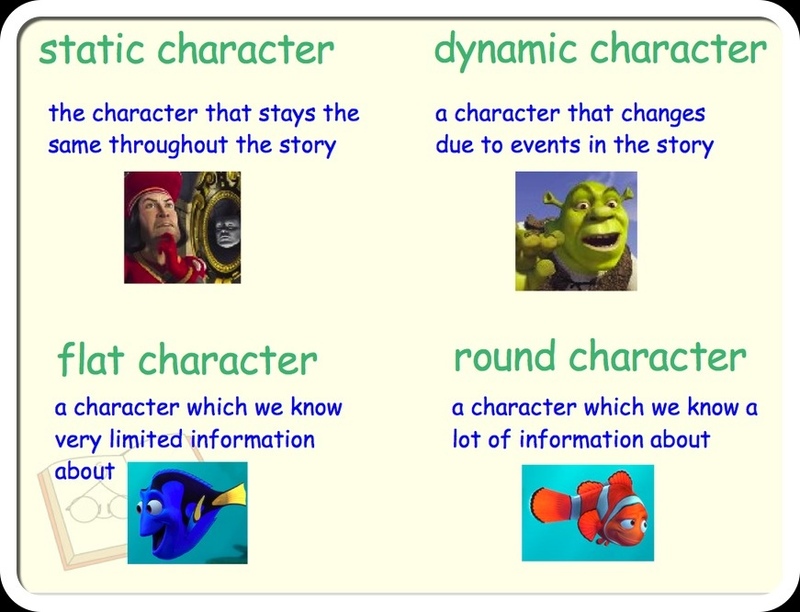 When we discuss the characters in our novels, we always distinguish between the round and flat characters and the static and dynamic characters. To help my students learn these types of characters, I use media from their world. I always start with a video clip to introduce Round vs. Flat Character. After viewing this video, I give students the definition of Round and Flat characters. I ask the students to decide which character is round and which is flat and we discuss how they fit the definition. It may be no coincidence that Dory is actually flat and Marlin is round. We then turn to this video to introduce Dynamic and Static characters. This is the handout they paste in their journal. Throughout the year, we will always make references to Dory, Marlin, Shrek, and Lord Farquaad when discussing character types. With each novel or short story, we will identify characters as such. For novels, they always complete a chart or keep a list in their journals. For short stories, it’s more of a discussion. It always amazes me how they can remember characters from stories early on in the year. 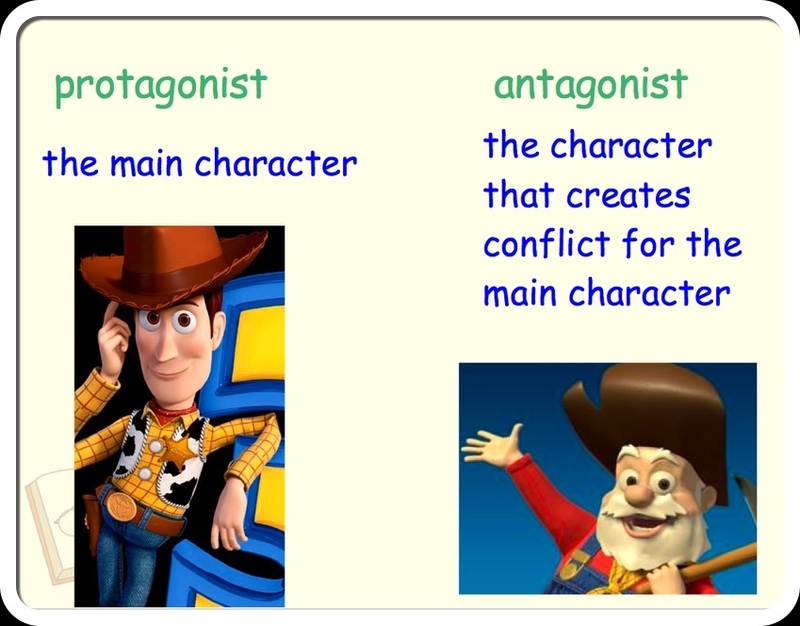 I teach protagonist and antagonist on a different day, referring to both video clips. Here is my handout. Take in movies from your DVD collection and pass the boxes around. Students will work in groups to identify the protagonist and antagonist in each movie. If BYOT is an option, students could watch videos that have been linked to Edmodo and identify character types. Students chose 5 of their favorite movies and list the protagonist and antagonist for each. Students could write an extended response to the following question: How would the movie change if the antagonist was not part of the story? Create a labeled dice (using the keyword dice tool) on the SMART Board that lists the characters from a particular novel. On a second dice, list the types of characters. Students roll both dice and then determine if they have a match. I use this with 6-8th grade. I know it’s been used (and approved!) with 5th grade and also with high schoolers. Kids just need a way to relate/remember. It’s silly but it works! A year later, I say “dynamic”…they say “Shrek”. I can see where it would be appropriate to change the movies used to something that is current. This year a student wanted to use Ironman for his protagonist. You could even have them search for their own examples on line after you show them with these examples. That does it. Will you come teach me how to teach? Good gravy, Woman, but you have amazing ideas!!!! Thank you!! Thank you! I am so glad you are getting something valuable out of my ideas. Do you have a Smart board? I would be happy to send you some of my stuff! Great Idea! I may just use this with my Inclusion class.